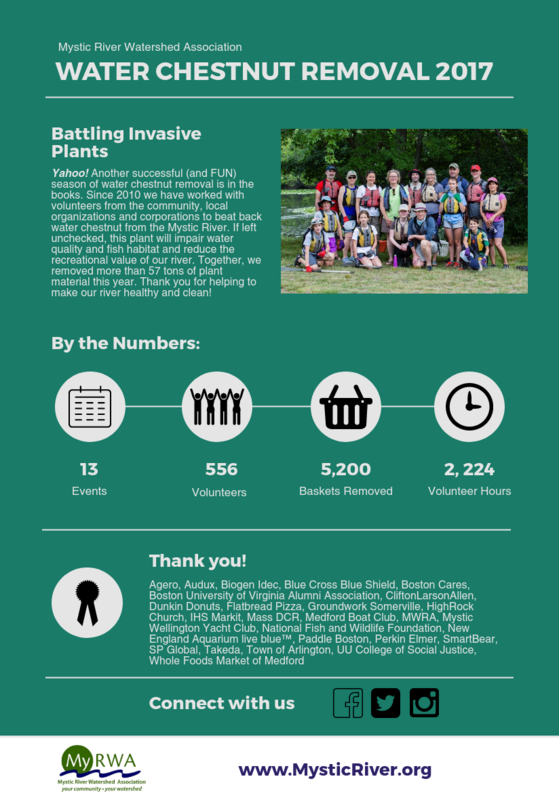 In our eighth year of water chestnut removal on the Mystic River and Arlington Reservoir, we've seen what teamwork can accomplish. Each year, community volunteers and corporate and non-profit teams head out in canoes to remove the invasive plant, water chestnut, by hand. They return to shore after two or three hours of work wet and dirty (did I mention dirty?) but with smiles on their faces. And many of them return again the next summer. It beats the office and they are helping improve a local waterway - the Mystic. We are making a difference! We are now able to skip over sections of the river where volunteers have successfully removed water chestnut in prior years. And we couldn't do this important work that keeps our river healthy without the many, many volunteers! Thanks to all who have lent a hand - and a special thanks to the 556 volunteers who make an impact on the Mystic in 2017. Check out the stats below!